Wood Henna Bangles and More! About 9000 years ago and steeped in tradition, the practice of henna tattooing began, a form of art and beauty unto itself. A little more than 45 years ago my artistic eye began to develop. After a vacation trip to the Middle East in 2000, the two events somehow collided to form my brand of whimsical art. For my whimsy mixed media -- I incorporate the swirls, curves, circles & lines of Mehndi (henna) art into my images - then married, rather randomly to my expression of realism which I suppose is my view of real life, & viola! Here you have it, special brand of what I coined to be "Bajidoo art". I work mainly in mixed media, most commonly -- watercolor, aquarelles, marker, pen & ink, and acrylics - but also work directly with henna paste, mixed especially for my purposes for creating art on wood and other surfaces. 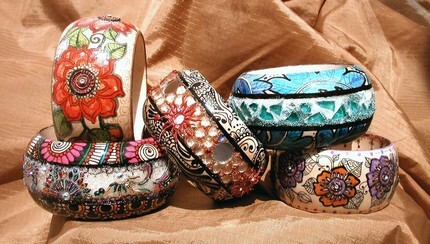 Stop by the store to see our current selection of henna bangles and henna boxes by Bajidoo. Remember, they are one-of-a-kind pieces and will not last long! Brenda's fantastic henna mixing video here! From the Bajidoo Premium Bangle line, this gorgeous bangle features sea glass, micro marbles, and sparkling Swarovski crystals to create a stunning, head-turning piece of jewelry. This is an amazing piece of artistic impression in anime style! In classic comic story telling style, this bangle begins with a square of the Princess followed by the Hero slaying a dragon for her. Wear your hero! That's right! These cool cuffs are made from records...you remember...big discs of vinyl that produced music. As a former record junkie, I'm delighted to see records in poor condition being used for wearable art instead of ending up in landfills. Everyone needs a LP cuff...Bajidoo style! Another gorgeous selection form the Premium Bajidoo Bangle line. Bold bright colors used for the henna style art are set off with rainbow bindi, micro marbles, and sparkling Swarovski crystals. Stunning box with a large matching bangle creates the perfect gift...especially at only 34.99! The inside of the bangle is decorated with a stunning floral henna design in bright pink. New Product Lines from Bajidoo Art! That's right! These cool cuffs are made from records...you remember...big discs of vinyl that produced music. As a former record junkie, I'm delighted to see records in poor condition being used for wearable art instead of ending up in landfills. Everyone needs a LP cuff! Introducing a new line of Premium Bajidoo Bangles made with sparkling Swarovski Crystals, semi-precious stones such as yellow citrine and rubies, and intricate bindi bangles. These are gorgeous and take wearable art to a whole new level.